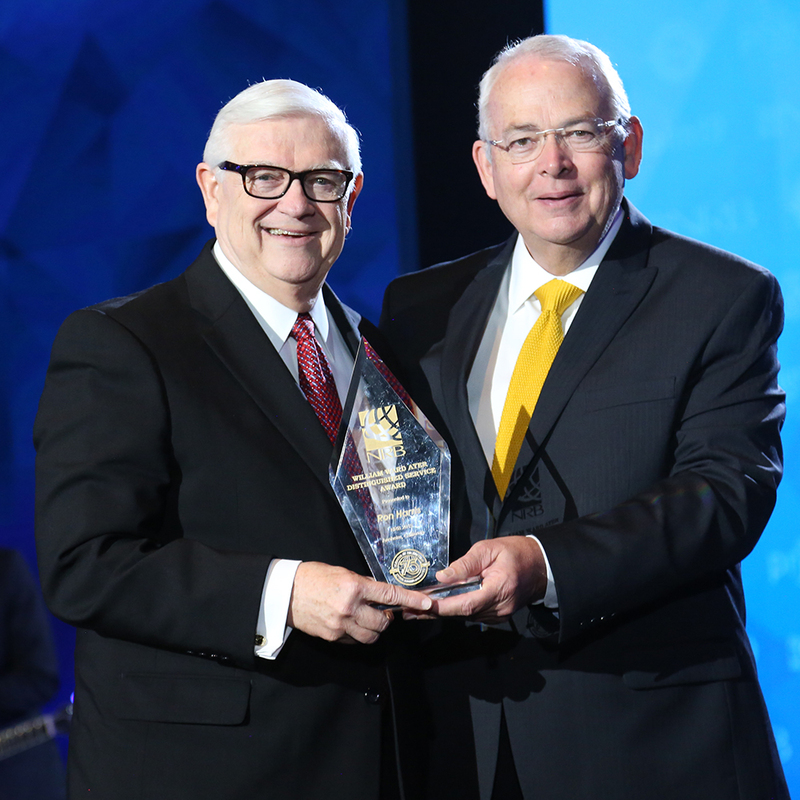 ANAHEIM, Calif. (NRB) – Dr. Ronald L. Harris, president of MEDIAlliance International, received the William Ward Ayer Award for Distinguished Service on Friday, March 29, during the Closing Gala at Proclaim 19, the NRB International Christian Media Convention in Anaheim, California. Pioneer broadcaster and pastor William Ward Ayer was NRB's first president. Instrumental in the formation of the Association, Ayer drafted the Code of Ethics that formed the basis of evangelical response to the radio networks' threat against religious broadcasting in the 1940s. The William Ward Ayer Award is presented to an individual NRB member with excellence and integrity for outstanding and significant contributions to the field of Christian communications. Ron Harris has been around broadcasting for most of his life, beginning in radio more than 50 years ago. Harris served with KCBI Radio in Dallas, Texas, for 15 years – most of that time as executive vice president and general manager and host of the morning program. Harris also served in the U.S. Air Force as a radio/TV specialist. Today, he is the founder and president of MEDIAlliance International, a ministry that trains and mentors Christian broadcasters and media leaders in more than 20 countries to grow the impact of Christian broadcasting and the Gospel of Christ. In addition, Harris has been a part of the National Religious Broadcasters for more than 30, serving through the years as a workshop leader and speaker, board member, executive committee officer, as well as chairman. After serving two years as assistant professor of communications and special assistant to the president at Dallas Baptist University, Harris served as senior vice president for strategic partnerships for NRB. He now serves on the NRB International Committee. The William Ward Ayer Award for Distinguished Service was one of 20 awards that were presented during Proclaim 19, which took place March 26-March 29, at the Anaheim Convention Center in Anaheim. For the complete list of 2019 award recipients, click here.